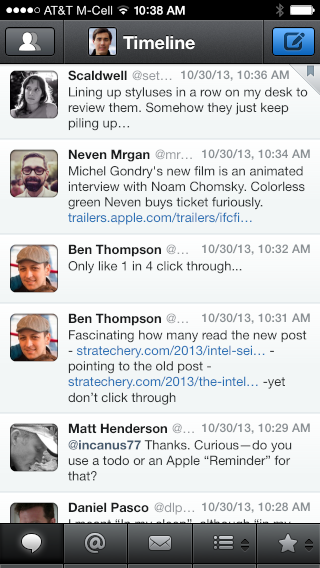 In general, I like the new Tweetbot 3 (App Store), but it follows two unfortunate trends with iOS apps. First, it did not remember my preferences or account info from the previous version. Second, it cannot fit as much on screen at once. Even with the smallest, non-bold font setting, there are fewer characters per line than I’d like. There is also additional vertical padding between tweets. It feels like my screen has shrunk. While the core aspect of the tweet drawer has stayed the same, the fact that it now opens immediately after you tap is a huge improvement in my opinion. I haven’t missed the triple tap actions because the tweet drawer makes it easier to access a wider set of shortcuts; the new animation retains the old app’s idea of “pushing down” tweets below the drawer, but it also reinforces a new kind of physicality that feels less like a robot and more like an object you’re directly manipulating. 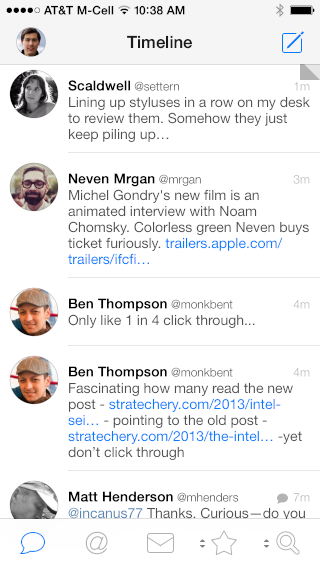 Update (2013-11-12): Tweetbot 3.1 adds a smaller font size, which is very nice. You can also turn off the round avatars and badges. I agree about the spacing. I was excited at first, but I quickly got annoyed and switched back to Twitterrific.